The 33rd MTV VMAs kicks off in a few hours, with promises of Bad Girl RiRi, Britney Spears, and at least four minutes of unfiltered Kanye West. The night is supposed to be about honoring music videos and artists' accomplishments within the medium, but that's not entirely why people watch. Yeah, this is the aging-but-still-necessary pop-culture shindig with all the Moonmen. It's also the one that provides memorable live performances and spontaneous moments. 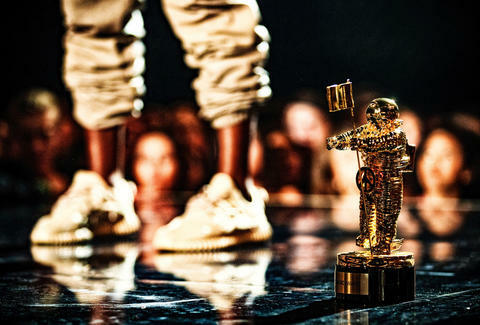 (Recall: this is the awards show that gave us the Yeezy-Swift feud and the Miley-Nicki tiff.) "Hotline Bling" has already been nominated more times than it should have (see below), so with that as an omen, fresh viral highlights and lowlights loom. Red carpet arrivals start at 6:15pm ET, followed by a DJ Khaled-hosted pre-show at 8pm. The main event goes live at 9pm, inside New York's Madison Square Garden. If you're not one of the special souls on site, you can watch all that via MTV's cable channel. MTV2, BET, VH1, Comedy Central, CMT, Spike, Logo, and TV Land will also air the telecast, and you can stream the festivities gratis on MTV's smartphone app and VMA website. Afterward, MTV will hold a Facebook Live post-show for those who have not gone catatonic. This year's VMAs notably marks Britney Spears' return to the stage; her latest album, Glory, dropped Friday. Others include Rihanna, Future, Ariana Grande and Nicki Minaj, Nick Jonas and Ty Dolla $ign, and The Chainsmokers and Halsey. Alessia Cara, Jidenna, and Lukas Graham will perform as part of the pre-show, outside MSG. There won't be a traditional host this year. Instead: Keegan-Michael Key and Jordan Peele (as their characters @LizardSheeple and @TheShamester, respectively) are serving as masters of ceremonies. Khaled, Jay Pharoah, and Nicole Byer will help as roving correspondents. Members of the U.S. Olympic squad, including Michael Phelps, Simone Biles, Gabby Douglas, Laurie Hernandez, Madison Kocian, and Aly Raisman, are coming to present awards. Jimmy Fallon, Kim Kardashian West, Ansel Elgort, Diddy, Shameik Moore, and Fifth Harmony will also lend a hand with the hardware. Rihanna will receive the Michael Jackson Video Vanguard Award, a lifetime achievement honor that celebrates an artist's contributions to MTV culture. She will open the night with a grand medley. There will likely be a tribute to Prince, David Bowie, and other late music icons. Selena Gomez and Justin Bieber, exes who have been sparring over social media as of late, might be in the same place at the same time. Frank Ocean and Barbra Streisand, both of whom just released albums, are rumored to present an award together. Seriously, Kanye will have four minutes to do whatever he wants. An exec producer of the awards show promised Entertainment Weekly that an up-and-comer will become a star. And the Beyhive is buzzing -- rightfully so -- about potential Beyoncé magic. Thrillist will provide further updates and live commentary about the VMAs throughout the night. Get your Twitter fingers ready, start praying for free Yeezys, and join us. Sean Fitz-Gerald is a staff writer at Thrillist Entertainment, and is already counting down the minutes until Kanye Time. Find him on Twitter: @srkfitzgerald.